The photography of Tony Sampas, who grew up in Lowell, ranges in subject areas from the realm of books and documents to the outer world of architecture and monuments. Painting was his first passion and the subject area he pursued when earning his BA in Art. Later, when an early digital camera fell into his hands, he developed a new love. “I found that the painting concepts I had studied such as light, color, and perspective translated directly to composing photographs,” he explained. He shared his images on facebook and the community took notice. Lowell historian and writer Richard Howe invited him to contribute to his popular blog. He returned to school, earning a Masters degree in Visual Arts at Lesley College. “Objects and Architectures” combines his thesis work with photographs he created for social media. 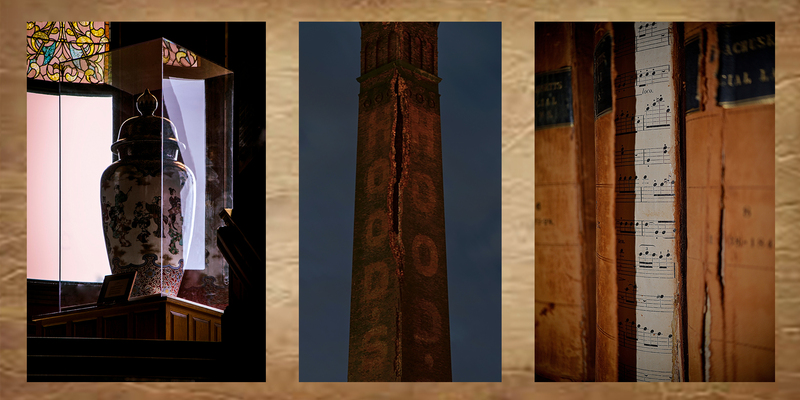 The image displays three of the photographs on display in the gallery. The exhibit is is up through January 20. An artist reception takes place on Saturday, January 6, 11:00 AM-1:30 PM.